← TGIF Concerts in the Park in Carlsbad, CA. I love my community! With baseball playoffs approaching at the end of this month I thought it’s be fun to get in the spirit with a little Padre Fun Facts. And no matter what you do in life, remember to swing for the fences! -What is the Padres mascot? The Swinging Friar. In the 1970’s it was the chicken. Cluck Cluck! -In 1974 Ray Kroc, the former owner of McDonalds saved the Padres from bring relocated to which city? 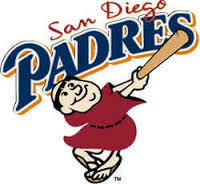 -In what year did the Padres change their color from brown and orange to navy and white? -On April 8, 1969 who did the Padres play against in their Major League Debut? Houston, Astros which the Padres defeated with a 2-1 game and an attendance of 23,370 fans. -The Padres hosted the All-Star Game in what year? -In the final game in the 2001 season which Padre player received their 3000th hit? -What year did Mr. Padre, Tony Gwynn retire? Tony spent all 20 seasons as a Padre beginning his career in 1982 and retiring in 2001. Tony retired with a .338 batting average and was a 15 year all-star who led the league in batting 8 times. We love America’s Finest City and are proud to call this home. To make San Diego your home or to learn more about this beautiful city visit http://www.threelagoons.com. We would love the opportunity to help you meet your real estate goals. This entry was tagged baseball, carlsbad real estate, Megan Schenck Real Estate Agent, San Diego, San Diego CA, San Diego community, San Diego lifestyle, San Diego Padres, San Diego real estate, san diego realtor, Southern Ca. Bookmark the permalink.